British American Tobacco has been in business for more than 100 years, trading through the turbulence of wars, revolutions and nationalisations as well as all the controversy surrounding smoking. The business was formed in 1902, as a joint venture between the UK’s Imperial Tobacco Company and the American Tobacco Company founded by James ‘Buck’ Duke. Despite its name, derived from the home bases of its two founding companies, British American Tobacco was established to trade outside both the UK and the USA, and grew from its roots in dozens of countries across Africa, Asia, Latin America and continental Europe. We were ‘born international’, and have developed over a century’s expertise in operating locally in diverse cultures around the world. The Management Board, chaired by the Chief Executive, comprises the Finance Director and the Chief Operating Officer of British American Tobacco p.l.c. along with the executives below. The Management Board is responsible for overseeing the implementation by the Group’s operating subsidiaries of the policies and strategy set by the Board of Directors, and for creating the conditions for their successful day-to-day operation. The Main Board is responsible to the shareholders for the success of the Group and for its overall strategic direction and governance. At least half the Main Board, excluding the Chairman, is comprised of Non-Executive Directors who are independent – they are free from any business or other relationships which could materially interfere with or appear to affect the exercise of their judgement and have not been previously involved in the management of the Group. Much of the growth of our leading brands is driven by innovation. We recognize that our business starts with our consumers and our brands. It’s not about encouraging people to start smoking or to smoke more, but about meeting the preferences of adults who have chosen to consume tobacco, and differentiating our brands from their competitors. We have never believed that ‘one size fits all’. Our portfolio of more than 250 brands is based on distinct ‘must-win’ consumer segments – international, premium, lights and adult smokers aged under 30 (ASU30). Our four Global Drive Brands – Dunhill, Kent, Lucky Strike and Pall Mall – cover the premium and value for money price segments. They grew by 4 per cent in 2009, or 8 billion more cigarettes. While developing our Global Drive Brands is central to our strategy, we are also increasing the profile of Vogue in the super premium segment and Viceroy, a leading low price international brand. Much of the growth of our leading brands is driven by innovation – from filters to flavours and packaging to cigarette formats. Overall our brand mix is broadly balanced between premium, mid-price and low-price more than cigarettes. While more than 95 per cent of the world’s smokers consume ready-made cigarettes you can find cigar and roll your own tobacco brands in our portfolio. Our cigar brands include Captain Black and the hand-made premium Dunhill Signed Range. Some of our Group companies sell Swedish-style snus, a form of smokeless tobacco that is placed under the lip and is reported by several independent health experts as being much less harmful than cigarettes. It’s sold under the Lucky Strike, Peter Stuyvesant, Pall Mall and du Maurier brands. As a major international Fast Moving Consumer Goods (FMCG) company, we are proud of our reputation for producing high-quality brands that are chosen by one in eight of the world’s adult smokers. Our four Global Drive Brands, Dunhill, Kent, Lucky Strike and Pall Mall, accounted for 27 per cent of our global volumes in 2009, or 195 billion cigarettes. Kent was introduced in America in 1952 and is now sold in more than 75 countries. It is our largest premium brand. Annual sales were 61 billion cigarettes in 2009, down 4 per cent on the previous year as a result of the economic downturn in key markets including Japan and Eastern Europe. Kent Nanotek, a superslim king size variant, is sold at a premium to the main range and grew by 24 per cent in 2009. Dunhill, which celebrated its centenary in 2007, sells in more than 100 countries. Dunhill offers a range of premium and super premium cigars and cigarettes. 41 billion cigarettes were sold in 2009, up 9 per cent on 2008. Key markets include Malaysia, Brazil, South Korea, South Africa and Saudi Arabia. Lucky Strike, launched in 1871, is one of the oldest and most iconic trademarks in the world. It’s a premium brand sold in more than 65 countries. Volumes rose 4 per cent in 2009 to 26 billion cigarettes. Key markets include Germany, Spain, Japan, France and Argentina. Pall Mall was introduced in 1899 and is now sold in more than 100 countries. It is our leading global value-for-money brand. Pall Mall volumes grew 10 per cent in 2009 to 68 billion cigarettes. Key markets include Germany, Italy, Russia, Uzbekistan and Pakistan. While the Global Drive Brands remain central to our strategy, we are also increasing the profile of Vogue and Viceroy. Vogue is a super premium brand selling in more than 55 countries. Key markets include Russia, South Korea, France, Italy and Romania. Viceroy is sold in more than 40 countries. Introduced in 1936, key markets today include Russia, Poland, Uzbekistan, Turkey and Argentina. Rothmans was launched in 1890 and is now sold in some 60 countries. Key markets include France, Italy, South Africa, Saudi Arabia, Yemen, Libya and Egypt. Kool was introduced in 1933 and is among the world’s biggest selling menthol cigarettes. Kool is sold in some 20 countries and is very popular in Japan, the United States and Latin America. Benson & Hedges cigarettes were created for the Prince of Wales in 1873. British American Tobacco acquired the rights to the brand in a large number of overseas markets in 1956. Today, our companies sell Benson & Hedges in more than 40 countries outside the European Union, including Nigeria, Australia, Saudi Arabia, Bangladesh and Malaysia. State Express 555 was launched in 1895 and is now sold in more than 20 countries. The brand is particularly popular with smokers in China, Taiwan, Cambodia and Vietnam. Peter Stuyvesant was first launched in South Africa in 1954 and then internationally in 1957. Now sold in around 30 countries, Peter Stuyvesant is popular in South Africa, France, The Netherlands, Greece, and Malaysia. Snus is currently being test-marketed under the Peter Stuyvesant brand by our company in South Africa. John Player Gold Leaf is sold in 12 countries and is particularly popular in Pakistan, Bangladesh, Sri Lanka and Saudi Arabia. The brand dates back to the 1890s. We do not own the brand in the UK, Europe or the United States. Our aim is to achieve business objectives in a responsible manner. We are committed to good corporate governance and to achieving our business objectives in a manner which is responsible and consistent with our beliefs in honesty, transparency and accountability. We regard corporate governance not simply as an exercise in compliance, but as a key element underpinning the sustainable, long-term growth of our business. These principles are reflected in our Standards of Business Conduct, which demonstrate our commitment to good corporate behaviour. They have been in place for many years, and continue to be kept under review in order to ensure that they remain at the forefront of best business practice. Every Group company and every employee worldwide is expected to live up to them. In addition, the principles set out within our Statement of Business Principles are designed to help meet the expectations placed on us by our various stakeholders, and they form the basis on which we expect our business to be run in terms of responsibility.The principal governance rules applying to UK companies listed on the London Stock Exchange are contained in the Combined Code on Corporate Governance, which can be found on the Financial Reporting Council’s website. British American Tobacco p.l.c. (the ‘Company’) has unlisted trading privileges for its American Depositary Receipts (ADRs) on NYSE Amex Equities. None of its securities are listed on any United States securities exchange or registered pursuant to the securities laws of the United States. As a result, the Company is subject to neither the NYSE Amex Equities listing standards nor the corporate governance rules under the Sarbanes-Oxley Act of 2002. Nevertheless, the Board has chosen, in the interests of good governance, to make a voluntary statement explaining the principal differences and common areas between the Company’s corporate governance practices and those that would be required if the Company were subject to those rules. The tobacco plant is in the same botanical family as tomatoes, potatoes, peppers or eggplants. An adaptive species, it can be grown economically from 50° Northern to 40° Southern latitude. More than 100 countries grow tobacco. China grows the most, then the USA, Brazil, India, Zimbabwe and Turkey. Tobacco thrives in poorer soils, providing farmers with a welcome alternative crop. In many cases, it provides a higher income than any other smallholder crop. It integrates well into environmentally friendly crop rotations, benefiting subsequent crops like maize. Most tobacco is harvested by hand over a period of two to three months Virginia tobacco is named after the US state where it was first cultivated. It is also called “bright tobacco” because of its yellow to orange colour, achieved during the flue-cure. This type grows particularly well in subtropical regions with light rainfall, such as Georgia (USA), southern Brazil and Zimbabwe. Classic English brands like Benson & Hedges and Dunhill use mainly Virginia tobacco. Burley is a slightly lighter shade of green than Virginia. After being air-cured, the tobacco turns brown with virtually no sugar, giving it an almost cigar-like taste. It needs heavier soils and more fertiliser than Virginia. The best Burley is grown in the USA, Central America, Malawi and Uganda. With Virginia and Oriental tobacco, it makes up an American Blend, as used in brands like Lucky Strike or Pall Mall. Oriental is the smallest and hardiest type, grown into the hot summer of the Balkans, Turkey and the Middle East. These conditions and a high planting density create an aromatic flavour, enhanced by sun-curing, as in a traditional Turkish cigarette. There are around 12,000 tobacco seeds in a gram – it looks rather like powdery instant coffee. The seeds are so small that they must be nurtured in specially protected seedbeds for 60 days before transplanting to the field. After a couple of weeks, soil is banked up around the seedlings for protection and to let them develop a good root system. Two months later, the flowers and some of the upper leaves are ‘topped’ to concentrate growth in the remaining leaves, like ‘pinching out’ tomatoes. As the plants grow, the farmer provides appropriate nutrition and watches out for pests. Except for some countries such as the USA, where the crop is mechanically harvested, the farmer will typically harvest by hand over two to four months, taking off two to four leaves per plant as they ripen. A typical farmer in Uganda, for example, with two to three hectares of land, will harvest about 15,000 plants of 22 leaves each. These can earn a good income from only a small part of the land. British American Tobacco can help by providing seeds, fertiliser and advice on planting, growing, harvesting and curing tobacco and other crops. Curing is a carefully controlled process used to achieve the texture, colour and overall quality of a specific tobacco type. During the cure, leaf starch is converted into sugar, and the tobacco changes colour from green to lemon, to yellow, to orange to brown, like tree leaves in autumn. Air-Curing: Air cured tobacco, such as Burley, is hung in unheated, ventilated barns to dry naturally until the leaf reaches a light to medium brown colour. At this point, there are virtually no sugars left in the leaf. Flue-Curing: Heat is introduced into a barn via pipes from an exterior furnace, like radiators connected to the central heating system. This controlled heat allows the leaves to turn yellow/orange, at which point they are fixed, containing a high amount of sugar. Virginia tobacco is flue-cured. Sun-Curing: Leaves are strung out on racks and exposed to the sun for 12 to 30 days. The sun’s direct heat fixes the leaves at a yellow to orange colour with a high sugar content. Oriental is the most prominent of the sun cured tobaccos. Fire-Curing: Fire-curing follows the same principle as producing smoked ham. Brushwood is burned under the leaves, drying the tobacco and producing a smoky fragrance. This type is mainly used in some pipe or roll-your-own tobaccos. After curing, the farmer grades the leaves into different leaf positions, qualities and colours, packs them into 30-50kg ‘farmer bales’ and takes them to a buying centre or auction for sale. After curing, the leaf is processed through a Green Leaf Threshing Plant. During threshing, the lamina is separated from the stem and subjected to a series of quality checks to ensure all sand, dust, scraps and foreign matter are removed. During processing, the moisture in the tobacco is brought down to a safe ‘keeping’ level and the processed tobacco is packed into 200 kg cardboard boxes for shipping to manufacturing sites. Tobacco has been smoked for at least three thousand years and for much of that time it has divided opinion, sparked controversy and provoked strong views. 150 years later the tobacco industry supports millions of jobs and hundreds of thousands of farmers choose to grow this resilient and reliable crop. Governments globally earn more revenue from tobacco products than the shareholders of the companies that make them. For example, in 2009, our subsidiaries enabled governments worldwide to gather more than £26 billion a year in taxes, including excise duty on our products, almost nine times the Group’s profit after tax. Views on tobacco have, if anything, become more polarised than ever in the 21st century and today the issue dominating the agenda is the risk to health. Yet tobacco products are legal and calls for a ban are very rare. Even with universal awareness of the health risks, around one billion adults worldwide make the choice to smoke. Few would dispute that for the foreseeable future many hundreds of millions of adults will continue to be tobacco consumers. A growing world population and rising incomes might suggest an increase, but we see this being offset as many smokers choose to consume less per day or to quit. It seems reasonable to predict a future where there are potentially lower risk products – provided there is regulatory consensus – and responsibly managed channels of marketing to adult smokers based on one-to-one ‘permission marketing’, with less reliance on channels such as mass media. Debate on ‘second-hand smoke’ is likely to continue, but we hope it will be around policies that provide real choice for both non-smokers and smokers. A key question for governments and regulators today – as perhaps it always has been – is, after all reasonable regulation, marketing constraints and product modifications, with prohibition not an option and millions of adults continuing to use tobacco, who would you prefer to manage the tobacco industry? We doubt that governments would welcome markets controlled by counterfeiters, organised criminals running ‘illegal’ cigarettes and back-door salesmen supplying them to children. We believe that governments can achieve a ‘win / win’: a scenario of gradually declining total consumption for health ministries; sustained value for well-run tobacco companies; higher tax collection for finance ministries; higher quality, potentially safer products for consumers and less tobacco smuggling and counterfeiting with improved law and order. The key to such a future is reasonable co-operation between governments and well-run, responsible tobacco companies. The tobacco industry contributes substantially to the economies of over 100 countries, and millions of people worldwide depend on it for employment. Tobacco taxes are a major source of revenue for almost every government in the world. Few industries are as wide-ranging as the tobacco industry. Most countries have a tobacco manufacturing industry, and the industry usually forms an important part of the economic and social fabric. Even in countries that do not have tobacco manufacturing, tobacco distribution is an important source of economic activity. Tobacco is the world’s most widely cultivated non-food crop. The farmers who choose to grow it – many of them in developing countries – do so because it is hardy, grows well in poorer soils and volatile weather, and is known for fetching stable prices. Farmers can earn good yields from very small plots of tobacco, enabling them to put tobacco earnings into growing other crops, such as food. The techniques used for growing quality tobacco also help to improve other crops. Less than 0.3 per cent of the world’s agricultural land is given over to tobacco farming – less than half the land given to coffee, for example – and only for part of the year, but it is an important contributor to the agricultural economy in many countries. “We found a man in a canoe going from Santa Maria to Fernandia. He had with him…some dried leaves which are in high value among them, for a quantity of it was brought to me at San Salvador”. – Christopher Columbus’ Journal, 15 October 1492. – Thomas Hariot, “A Brief and True Account of the New Found Land of Virginia”, 1588. Tobacco has been smoked for at least the last three thousand years. Christopher Columbus found it when he landed in the Americas in 1492, but ancient temple carvings show tobacco being smoked in Central America as long ago as 1,000 BC. Ever since it arrived in Europe in the late 15th century, tobacco has divided opinion, sparked controversy and generated substantial revenue through tax. Not long after it reached Europe, it was being described in terms ranging from “vile custom of manifold abuses” and “feast for the fiend” to “the divine herb” and “cornucopia of all earthly pleasure”. Tobacco has periodically been subject to royal disapprovals, the whims of fashionable use, medicinal studies, smuggling, trade disputes and bans. See the animated feature ‘The history of tobacco’ or follow the links in the lefthand menu for a brief snapshot of the long and fascinating history of this enduring product, smoked by about a billion adult consumers around the world today. Our Group purchases approximately 400,000 tonnes of tobacco leaf a year, around 80 per cent of it by volume from farmers and suppliers in emerging economies. We aim to ensure that we only purchase leaf from responsible and sustainable sources. Our Social Responsibility in Tobacco Production programme addresses the social and environmental issues associated with tobacco growing and processing and reaches more than 250,000 farmers who supply all the leaf we buy. The programme covers good agricultural practices for improving soil and water conservation, appropriate use of agrochemicals, and environmental, occupational health and safety standards. It is also active in eliminating exploitative child labour and promoting afforestation initiatives for the farmers who require wood for tobacco curing to obtain it from sustainable sources. The conservation NGOs in the British American Tobacco Biodiversity Partnership support us in making continuous improvements to our programme. For example, biodiversity conservation elements have been included throughout, along with elements to enhance focus on the sustainability of wood sources. Within British American Tobacco, Social Responsibility in Tobacco Production includes a relationship with farmers that is unique in our industry, with our companies giving agronomy support to some 160,000 growers who are directly contracted to supply, on average, two thirds of the leaf we buy. For many years this support has involved leaf staff in our companies working in the field alongside farmers, many of whom are small producers in scattered rural communities, to provide farmers with seed and training, advice and support on all aspects of crop production and environmental best practice. This benefits both the farmers and us in improving crop yields and quality, while helping growers to address the environmental and social issues associated with tobacco growing and processing. We have also worked to extend Social Responsibility in Tobacco Production, by encouraging others in the industry to adopt a similar approach. Our methods of reviewing leaf suppliers have been adopted by a number of tobacco manufacturers, while others have adopted similar programmes of their own. As a result of our efforts to extend the concept, the leaf our companies purchase on the general market – around one third of 400,000 tonnes in 2009 – also now comes from leaf suppliers who, at our request, have chosen to adopt the programmed. See Social Responsibility in Tobacco Production for more information about the elements covered by the programmed. We helped to establish the Eliminating Child Labour in Tobacco Growing (ECLT) Foundation and support it actively as a founding member. We are committed to the principles of protecting children from child labour exploitation, believing that their development – as well as that of their communities and countries – is best served through education, not child labour. We do not employ children in our operations. Child labour can mean many things, although it is generally described as the exploitation of children in the workplace. It has become a major issue of concern in recent times. According to the International Labour Organisation. 218 million children are involved in child labour globally. In 1990, the United Nations achieved a human rights milestone with the UN Convention on the Rights of the Child. In 1996, child labour was addressed at the International Labour Organisation (ILO) conference, where a resolution was adopted on the elimination of exploitative practices. Tobacco farming, particularly in developing countries, is one of the sectors with a child labour problem. As the only international tobacco group with a significant interest in tobacco leaf growing, we are committed to working with other key stakeholders, including tobacco farmers, to address the problem in our supply chain. In 2001, British American Tobacco helped to establish the Eliminating Child Labour in Tobacco Growing Foundation with the International Tobacco Growers’ Association (ITGA) and the trades unions in our sector, the IUF (International Union of Food, Agricultural, Hotel, Restaurant, Catering, Tobacco and Allied Workers’ Associations). The Foundation grew out of an international partnership we had formed with the ITGA and the IUF in July 2000 to work against child labour in tobacco growing, to raise awareness of the problem and to involve all the stakeholders in the sector. To galvanise action, an international conference was held in October 2000 in Nairobi, Kenya, hosted by British American Tobacco and attended by farmers, trades unionists, NGOs, government officials, the media and manufacturers from three continents. Its current director is Marilyn Blaeser, who was previously with the Canadian International Development Agency. The IUF, ITGA and British American Tobacco continue to play active roles as founding members of the Foundation’s Board. The Board is advised by the International Labour Organisation and its members include the tobacco manufacturers Imperial Tobacco, Japan Tobacco, Philip Morris International and Altria, along with the leading leaf processing companies Universal and Alliance One International. Establishing and sharing best practice and lessons learned. You can find out more at the Foundation’s website www.eclt.org or you can download their Annual Report 2008 . You can download Our Group Child Labour Policy in Our principles and standards. As well as tobacco leaf, we purchase a wide variety of other goods and services from suppliers all over the world. We promote continuous improvements amongst our suppliers in business practices, efficiency, quality, innovation and corporate responsibility. To learn more about how we engage with our suppliers visit Working with our suppliers. Keeping track of the various types of tobacco and blend components in use is key and computers are increasingly used to track production runs. Moisture content is also crucial. Too dry and the tobacco leaf will crumble; too moist and it may spoil during storage. The blended tobacco is treated with just the right amount of steam and water to make it supple and is then cut into the form used in cigarettes. Excess moisture is then removed so the cut tobacco can be given a final blending and quality check. The technology has advanced dramatically over the years. Cigarette making, once done entirely by hand, is now almost fully automated, with the cut tobacco, cigarette paper and filters continuously fed into the cigarette-making machines. Quality is a top priority. Each cigarette is automatically quality controlled to ensure that it meets every aspect of its specification. Packing machines put them into the familiar brand packs, wrap the packs in protective film and group them into cartons and cases. There is more testing at each stage to make sure the cigarettes are properly protected before the completed cases are ready for distribution. As a multinational business, we work to ensure that our costs are globally competitive and that we use our resources as effectively as possible. To improve productivity and to continue building a sustainable business, our companies have had to take some significant and difficult decisions to reduce manufacturing overcapacity by closing some factories and downsizing others. We fully recognise the impacts of these decisions and work hard to mitigate the outcomes for employees and the wider community. These changes are also enabling us to rationalise our machine technology to establish a more cost-effective operational base for the future. Most machinery in factories being closed or downsized is transferred elsewhere and we aim to standardise machinery at each location. Machinery that cannot be redeployed within the Group is destroyed, not sold second hand, to ensure that it cannot fall into the hands of counterfeiters. For more about this, see How we tackle illicit trade. Ingredients have been added to tobacco since the 16th century We want consumers and governments to know the facts about ingredients used by our companies in the manufacture of cigarettes, cigars, roll-your-own tobacco, pipe tobacco and smokeless snus. The primary component of all our companies’ products is of course tobacco and the character, flavour and aroma is determined mostly by the tobaccos used. In fact, cigarette brands can contain many kinds of tobacco – blending different types of leaf from many growing regions and harvests. Small quantities of other ingredients have been added to tobacco products for hundreds of years – helping to control moisture levels, maintaining product quality or acting as binders or fillers. Certain food-type ingredients, or flavourings, are added to balance the natural tobacco taste, often replacing sugars lost in the curing process. Several of the flavourings used are recognised food stuffs such as sugar, while others are derived from natural herbs and spices or their essential oils. Consumers like choice and ingredients allow manufacturers to widen the variety on offer and compete for custom. We voluntarily publish the ingredients we use and you can find out what’s in your brand by visiting www.bat-ingredients.com to see ingredients by country and brand. Some anti-tobacco groups claim that ingredients are used to make smoking more appealing to children and more addictive. Through the World Health Organisation’s Framework Convention on Tobacco Control, an international treaty, these activists would like to see broad-based ingredients bans by governments worldwide. All tobacco products pose risks to health, but based on available scientific evidence, the ingredients our companies use, at the levels used, do not add to the health risks of smoking. Nor do they encourage people to start smoking or affect a person’s ability to quit. Ingredients are not added to make our tobacco products appealing to children, and there is no evidence that they have this effect. Although ingredients in some types of cigarettes include sugars, cocoa and fruit extracts, they do not create a sweet, chocolate-like or fruity taste in the smoke. In short, our cigarettes still taste like cigarettes and not sweets or candy. Nicotine is not added to tobacco products – it occurs naturally in tobacco. Smokers in countries such as Canada, Australia and the UK have historically preferred the taste of Virginia-style cigarettes which contain few or no ingredients. In the US and Germany, for example, smokers prefer cigarettes that blend different types of tobaccos such as burley and oriental which generally need the addition of ingredients. Such brands are known as US blended. The USA, where US-blended style cigarettes are popular, and Canada, where the cigarettes preferred are Virginia, provide a good example to illustrate this. Studies in these two culturally similar countries reveal there are few, if any, differences between them when it comes to underage smoking incidence, adult smoking incidence or estimated quitting rates. We would support restrictions on ingredients based on sound evidence, supported by published and peer-reviewed science, that they induce the under-age to smoke or make tobacco products more addictive or harmful. But many organizations feel that baseless bans could potentially cause major disruption to the livelihoods of thousands of growers of burley and oriental tobacco worldwide. The International Tobacco Growers’ Association, which presents the cause of millions of tobacco growers around the world, feel the proposal could decimate growers’ livelihoods. They say a ban will “send the economies of countries that rely on tobacco export crashing, along with millions of farmers and workers whose livelihoods depend on growing tobacco”. We are also concerned that any ban on US blended cigarettes could drive many consumers to the black market to find the tastes they prefer, adding to a growing global problem of illicit trade. Illicit trade accounts for an ever increasing proportion of the tobacco market in a growing number of countries – an estimated 30 per cent in Ireland, over a quarter in Romania and Malaysia and 50 per cent in Hong Kong, for example. Of course, black market cigarette sellers are unlikely to adhere to laws about not selling to the under age. Not all cigarettes are the same. Smokers around the world prefer many different tastes and strengths and our companies aim for excellence in every step of manufacturing. Cigarette design is more complicated than it may seem. Our companies work to understand the preferences of adult consumers and to design cigarettes to meet them. It’s the preferences of adult consumers that guide our tobacco blends – the mix of tobaccos that we use – and we work to ensure that these grades are available long-term to keep the tastes of our products consistent. Food-type ingredients and flavourings are added to some types of cigarettes – typically American style blends – to balance the natural tobacco taste, replace sugars lost in curing, and give individual brands their characteristic flavour and aroma. Other ingredients control moisture, protect against microbial degradation, and act as binders or fillers. For more information, see Ingredients. Nicotine is not added in making cigarettes. It occurs naturally in all varieties of tobacco plants. 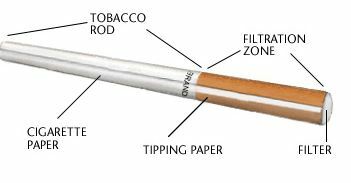 The filter, paper and level of filter ventilation are all chosen to affect the sensory strength and smoke yield of the cigarette. At each stage, there is constant quality control and testing. The filter and tipping around the filtration zone. The tobacco in the rod includes tobacco lamina (the flat part of the tobacco leaf), tobacco stem (midribs of the leaf), and expanded lamina. The cigarette paper includes paper and adhesive. The filter is made mainly from cellulose acetate fibres, known as tow. Cellulose acetate is derived from wood pulp. The fibres are bonded together with a hardening agent, triacetin plasticizer, which helps the filter to keep its shape. The filter is wrapped in paper and sealed with a line of adhesive. Sometimes charcoal is added to filters. The tipping paper includes paper and adhesive. Design adjustments achieve different strengths and tastes, and can reduce smoke yields of various smoke components, as measured by a standardised machine method. See Cigarette design and manufacture on the drop-down menu. What happens when a cigarette burns? To understand cigarette design, it helps to know how a cigarette burns. It is the combustion process – the burning of the cigarette – that produces tar. If hay were burned instead of tobacco, it would also produce a type of tar. When an item burns, it produces tiny particles mixed with gases – this is smoke. A cigarette filter traps some of these particles. When a smoker puffs on a cigarette, whole smoke, including both fine particles and gases, is sucked through the tobacco rod and the filter. Gases pass through the filter, and some particles are trapped in it. It is this particulate matter, minus nicotine and water, that is called tar. Smoke has over 4,000 constituents, many of them also found in the air we breathe and our food. These constituents include the emissions listed on packs, such as tar, nicotine and carbon monoxide. Water vapour is also produced by the combustion, because the burning of any organic material breaks down the chemical components and produces water. Our filter tips are biodegradable over a period of between a month and three years, depending on environmental conditions. Although we are researching more rapid breakdown, at present we know of no practical way of making consumer-acceptable filters that would degrade so quickly that they would not cause short-term littering problems. We believe the best way to reduce potential litter problems is for consumers to dispose of filters and cigarette packs in a responsible way. Smoking poses real risks of serious diseases. That’s why we are working to develop products that may be recognised as less harmful. For more about the health risks of smoking and our harm reduction efforts, see Health and science. Aromatic pipe tobacco blends have rich aromas and are usually known as Mixture or Cavendish. Non-aromatic pipe tobacco is sometimes called Straight Blend. This is a blend of non-aromatic tobacco and has a natural smell of tobacco when smoked. It is not just the aroma that affects pipe smoking. The cut or size of the tobacco affects how it packs into the pipe, how well it stays lit and how fast and hot it burns. A larger leaf cut may burn slowly and evenly but may be difficult to pack and to keep lit. Crimp cut is lightly pressed short cut tobacco varieties, curled by drying and heating. Curly cut is formed when dark and light tobacco leaves are rolled into a cord, usually enclosed by an extra light leaf. Navy cut is pressed tobacco, cut into thin slices and crumbled before use. In recent times, the use of pipe tobacco has declined and it now makes up less than 1 per cent of the world’s tobacco consumption.